Matte navy blue graduation gowns are a perfect choice for those graduating in philosophy, political science, or for anyone who simply wishes to show their school spirit. Your graduation is a celebration that you will always remember. Your friends and family will join together from all over in order to show their support and honor you on your success. If it wasn't for your total commitment and whole lot of hard work, you might not have been able to reach this point in your life. I'm sure that throughout the duration of your schooling challenges you were able to build a handful of new friendships as well as a few sentimental memories to help you make the process a bit easier. At Honors Graduation we know how difficult your journey may have been, that's why we want to help make shopping for your graduation attire easy and stress free. Normally students who are graduating wear a graduation cap and gown along with other graduation accessories to represent various achievements they may have earned. Honors Graduation has everything you may need to be completely prepared for this significant day, from cap and gown sets all the way to keepsakes and accessories. Each of our products is made using the very best material for your satisfaction. Each item found in our inventory is available for individual purchase, however we also have various package deals to simplify the shopping process. Our Cap & Gown + Tassel deal includes your matte navy blue robe along with the matching cap as well as a free tassel of your color choice. Our gowns come in a variety of sizes, for heights accommodating students from about 3 feet up to 7 feet tall including multiple plus sizes in addition. We will throw in a free tassel even if you choose to buy your graduation cap separately! 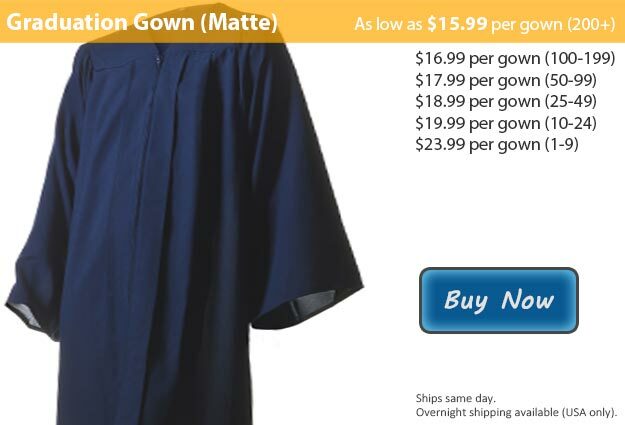 This graduation robe is also available in Navy Blue Shiny Fabric.